Anything that involves cooking with sherry always piques my interest and I have Nigel Slater (My British culinary hero) to thank for this recipe. I came across it while reading a review of his latest cook book. NS is the master of fast and simple good food; his recipes always make my mouth water and this is no exception. Plump chicken thighs, dry sherry, marcona almonds and baby potatoes combine to make a luxuriously simple dish – good enough for a special dinner party. I tweaked it slightly by adding a handful of pitted green Castelvetrano olives for some color and their mild, fruity quality. If you can’t find them, try something similar or leave them out altogether as the result will be superb either way. You’ll need to use bone-in chicken thighs with the skin on. These are becoming more and more difficult to find as a result of the growing obsession with a perceived need to cut fat from our diet. (You can find them in Whole Foods, along with the pitted Castelvetrano olives and marcona almonds). You don’t need to eat the skin but because you brown the chicken first, skin is best and the end result will have more flavor. This recipe is for two – just increase everything accordingly if you’re feeding a crowd. You’ll also need a wide ovenproof pan with a lid. Season the thighs with a good grind of black pepper and a sprinkle of sea salt. 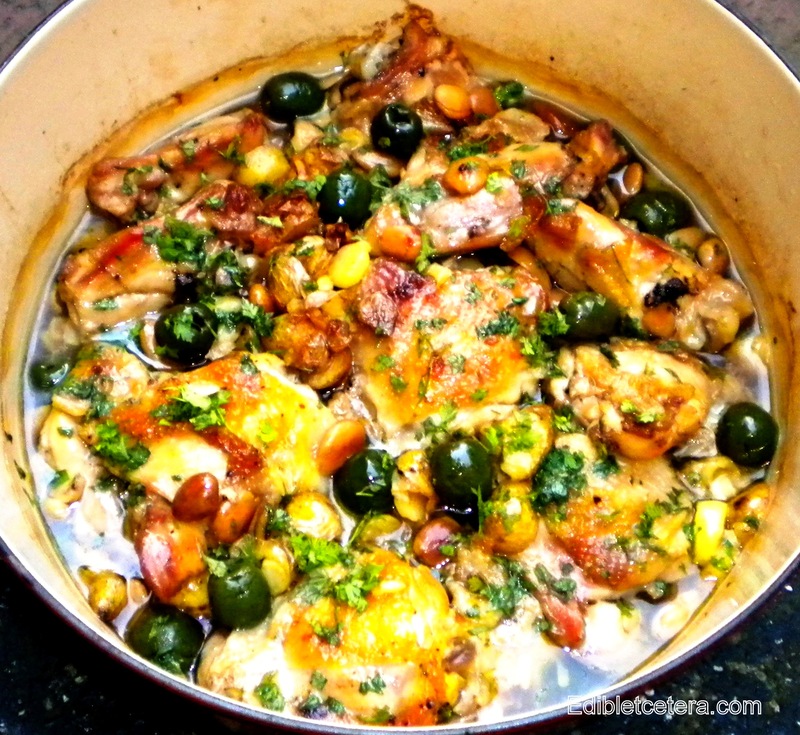 Heat the oil until moderately hot in a wide pan and brown the chicken pieces for about 8 minutes, turning occasionally. Preheat the oven to 350F (180C). Halve (if really small) or slice the potatoes into thick coins and add them to the chicken, stirring until the potatoes start to brown. Add the almonds, continuing to sauté until they become golden. Now add the sherry, crank up the heat a bit and let it all bubble for 30 secs, then add the water and olives (if using). Take off the heat and stir everything gently. Put a tight lid on it and bake in the oven for 30-40 minutes. If you like your chicken falling off the bone, turn the heat down to 325F (160C) and give it another 30 minutes but baste the chicken first and make sure you still have enough liquid. If the lid was tight-fitting enough, you should; otherwise add a splash more water. Sprinkle with chopped fresh chervil to serve – and some al dente brussels sprouts on the side wouldn’t go amiss. You can make this ahead. Cool, cover and chill, then reheat very gently in a low oven.